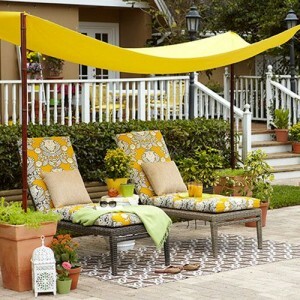 This DIY Canopy can be positioned in any direction and gives you a wonderful pop of colour in any fabric print you desire for your new home out door space. To create the posts you’ll need to simply put PVC pipe into a 5-gallon bucket, then pour cement around it. Once dry, place the bucket into a larger planter, surround the bucket with gravel, then top with soil making sure not to cover the pipe. 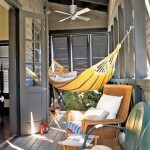 Finally, stick bamboo poles into the pipe and hang your fabric with ties through grommets. 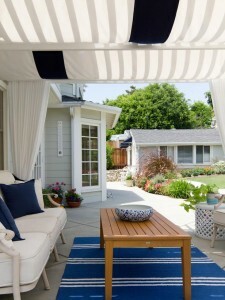 A white pergola with white sheer or linen fabric provides plenty of shade without sacrificing the sunlight. Keep the brightness and airiness of daylight with flowing fabric while cozy furnishings and blue accessories dress up this outdoor living space making it an inviting oasis in your new home. A retractable awning allows you to entertain in the shade during the day and enjoy stargazing at night during backyard gatherings in your new home. 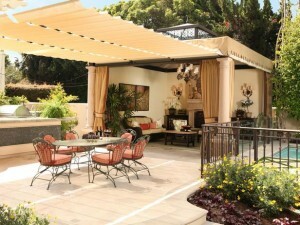 The versatility you get with an awning allows you to transition from day to night with just the touch of a button. This ultra-modern outdoor design features sliding panels for shade which offer both practicality and style. 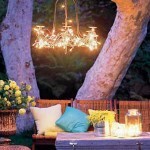 Entertain family and friends in a chic ambiance allowing you to maximize the potential of your new home. 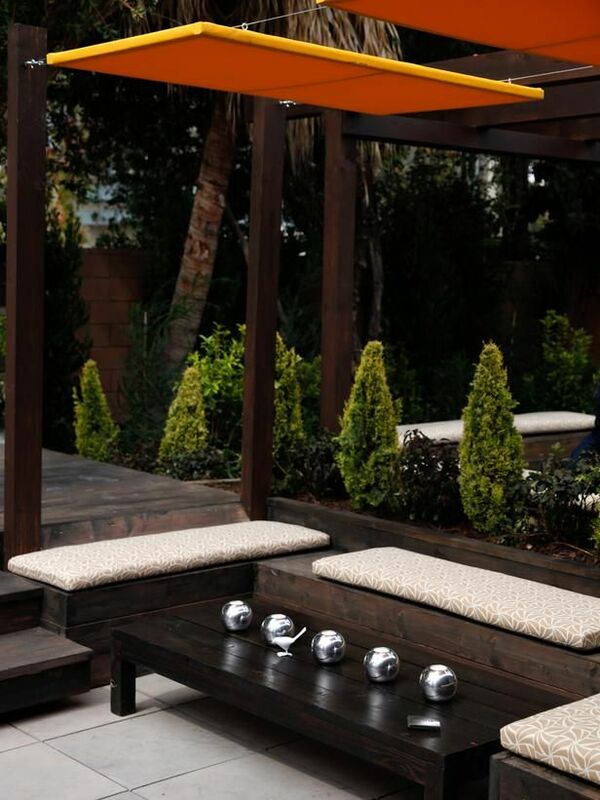 The versatility of these sliding panels allow you to re-position throughout the day in line with the movement of the sun so that you’ve also got comfortable shade. For more great ideas and design inspiration on ways you can improve the look of your new home, be sure to visit the Mosaik Homes Facebook Page!